It would seem that it does not take much for one-time U.S. officials to sell out to the highest bidder… this time, it is the Chinese. These individuals are now lobbyists for the communist Chinese — a stone cold enemy of the United States and a threat to our existence. Where does business end and treason begin here? Evidently loyalty ends where their bank accounts begin. As China becomes increasingly wealthy, they have retained D.C. insiders to lobby their interests and do their bidding. Just as China has infiltrated our colleges and businesses, they have insinuated themselves into our halls of power. The best example of that is Mitch McConnell and his wife Elaine Chao. She has a powerful family in China and they both have economic interests there, which in my viewpoint, compromises them. But they certainly aren’t alone. I came across a great article at The Daily Beast by Bethany Allen-Ebrahimian on the subject yesterday. I don’t go there often as a lot of what they put out is very leftist, but this caught my attention: “Meet the U.S. Officials Now in China’s Sphere of Influence.” It covers how the Chinese government and companies are retaining public relations and lobbying firms in D.C. Many times, they are hiring former U.S. officials to work directly for them. For a company to do business in China, a Chinese government official must sit on the board. If you play by Chinese rules, it opens a multitude of doors for a company there. If you don’t, you are shut out and can’t do business in China, period. 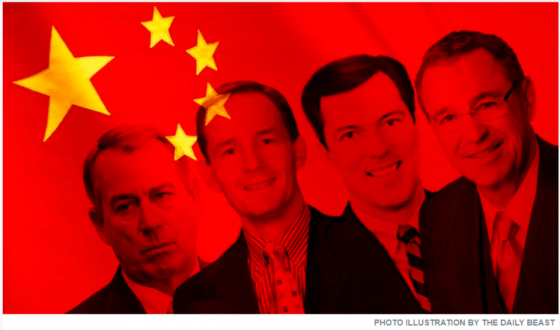 This power holds sway over many companies that want to do business in China. This has raised concerns that current U.S. government officials may be considering their future prospects in China even before leaving office. Such people are many times easily compromised by their financial interests. This is not new and in many corners of The Beltway, it is considered ‘normal’. But it’s not and it is alarming. It opens the door to communists buying influence in the American political sphere. “Nobody in the 1980s would have represented the Russian government. And now you find so many lobbying for the Chinese government,” said Frank Wolf, a retired U.S. representative from Virginia who long served as the co-chairman of the Tom Lantos Human Rights Commission. “I served in Congress for 34 years. I find it shocking.” Wolf, by the way, is a Republican and has long been concerned over human rights in China. Allen-Ebrahimian has come up with a list of a few that are now being influenced by China and some of them are very familiar unfortunately. I am going to excerpt and give you exactly what Bethany wrote as she did a great job. I just want to point out here that you will notice that she left out political affiliation for the most part. These officials come from both sides of the political aisle. Phillips spent 28 years in the CIA, finishing his tenure as station chief in Beijing. But after he left the agency, Phillips took the unusual step of remaining in Beijing and joining the private-investigations firm Mintz Group. Multiple sources told The Daily Beast that Phillips’ decision to peddle his services in Beijing has raised eyebrows within the agency. This should alarm Americans. Just as we have Russian spies infiltrating conservative and liberal groups alike, we have the Chinese who have been doing so for decades. Those who look for wealth are easily corrupted in such ways. It is not “McCarthyism” to point out that we have let our institutions become compromised with communist spies and that they are actively not only buying up pieces of our country, but are buying control and power in our government institutions. There are many more ‘useful idiots’ on Capitol Hill than those above. Isn’t it time we put America first and stopped inviting the enemy in to sabotage and conquer us? Just a thought. Should we go to war with China, we could be defeated from within before we are ever defeated on the battlefield.